Together For Latinas, Inc. (TLA, formerly known as The Latina A.R.M.Y. Inc.) aims to promote the positive life development of adolescent Latinas ages 12-18. 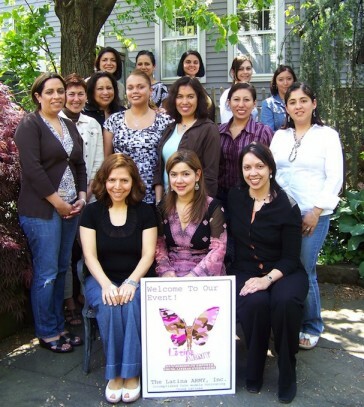 TLA’s program model, La Mariposa: A Personal Empowerment Program for Adolescent Latinas, is designed to celebrate and empower young Latinas for personal excellence. Our vision is for all Latina girls to have access to positive role models and programs that provide effective life skills that promote healthy behaviors, personal well-being and fulfillment. We have aligned TLA to partner with caring individuals and providers to deliver our signature curricula, La Mariposa. The La Mariposa program model is rooted in the Latina experience and built on the foundational principals of effective programming for girls, using a relational, trauma-informed, and strengths-based approach throughout the sessions. This rich combination is integrated throughout the curriculum, providing facilitators with a structured format, instructions for creating a safe space, and activities that create opportunities for girls to support one another. La Mariposa helps girls learn valuable skills while sharing their ideas and experiences with a trusted adult. La Mariposa is unique: Relational, Culturally-Specific, Strengths Based and Trauma Informed! A growing number of studies and national publications highlight the need for culturally competent programs in order to engage participants and to maximize the program’s effectiveness. According to the National Child Traumatic Stress Network, “cultural competency needs to a priority” when working with Latino youth. Moreover, organizations and foundations, such as the Family & Youth Services Bureau, the National Clearinghouse on Families & Youth and Advocates for Youth, recommend culturally relevant and gender-specific programming as critical elements to improving outcomes for underserved populations. In the US, many first and second-generation adolescent Latinas experience great difficulty trying to bridge two cultures where values and gender role expectations often collide. Many girls feel isolated and misunderstood. They need us, and in particular they need effective programs and access to accomplished Latina women who have faced similar struggles and succeeded in balancing their dual cultural identities. Young Latinas represent the fastest growing demographic in the U.S. By the year 2050 1 in 4 U.S. women will be of Hispanic descent. We have an opportunity to empower this generation of leaders. Don’t wait. Get involved TODAY! Empowering Latinas for Personal Excellence!